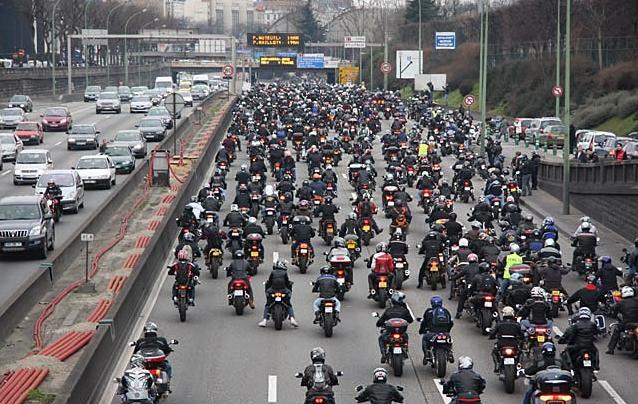 No to a compulsory annual environmental and road safety test for motorcycles in France! UK France bikers.com has been informed that the French Government’s proposals for a compulsory annual road safety and environmental test for motorcycles (equivalent to the UK MOT) will NOT be introduced on 1st January 2011, as originally planned. Are we surprised? No, we are not at all. The Government has seen two enormous national protests this year (13th March and 23rd October), gathering each more than 40,000 bikers, who brought the whole country to a complete standstill and caused massive embarrassment to the authorities. So it sounds like the French Government may now start to listen to the bikers and back off. This is fantastic news for all bikers in France, however, this is not over yet, as the Government at this stage is only delaying the introduction of the test by 12 months, to 1st January 2012. What the authorities obviously don’t realise is that until they scrap their plans completely and once for good, there will be 40,000+ bikers blocking the whole country again and again, and bringing misery and delays to millions of commuters nationwide. 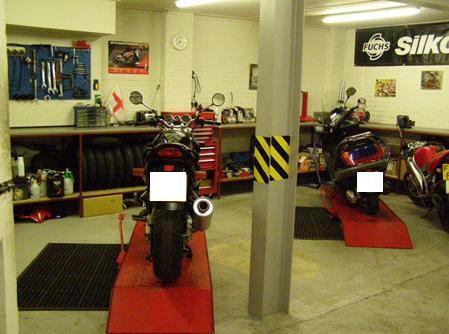 “Delaying the introduction of the proposed compulsory annual technical test for motorcycles is not good enough” says an angry biker based in Paris. “We will continue to protest and bring chaos to the whole country until the Government scraps its plans and recognises that it is additional training that is required to reduce road accidents, not an annual safety and environmental test that is purely a stealth tax to generate more revenue and doesn’t help to reduce road collisions”, says another angry biker based in Toulouse, France’s fifth largest city. ... And again on 23rd October 2010! At the same time, and again thanks to the efforts of the FFMC (French Federation of Angry Bikers), the Government will be introducing on 1st January 2011 a compulsory training course for all 125cc riders, who don’t hold a full motorcycle licence (category A, A1 or A2) but hold a car (category B) licence. This is pretty much like in the United Kingdom with their CBT course (Compulsory Basic Training), being a compulsory one day course every two years during which trainees are taught (and/or reminded of) the basics of motorcycling by a qualified instructor. The French motorcycling community welcomes the initiative, as this clearly represents a step forward towards recognising that bikes are not to be driven and treated like cars. What about traffic filtering / lane splitting? French bikers also want traffic filtering or lane splitting made legal in France, but the Government has not (yet) made any announcement in this regard. We expect massive motorcycle protests to continue to take place all over France throughout 2011 and until the authorities are brought to complete submission, that is the permanent scrapping of the proposed annual environmental and road safety test for motorcycles and make traffic filtering or lane splitting legal for all motorcyclists. 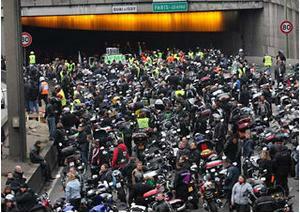 It sounds like French bikers are not prepared to compromise with their Government in any way. It’s all or nothing. If you’re based in France and want to take part of the fight against the Government’s proposed introduction of a compulsory annual environmental and road safety test for motorcycles and their continued policy to ban motorcyclists from filtering through traffic, then become a member of the Fédération Française des Motards en Colère (FFMC – French Federation of Angry Bikers). If only the UK government was as receptive to ideas, and not a complete bunch of moronic troughers who allow the likes of Westminster CC to act ultra vires with it’s cash cow parking scheme.